THIS IS A ONE-OFF GARMENT... WHEN IT'S GONE, IT'S GONE! This Minzah tunic is my NUMBER ONE BESTSELLER! For details about this scrumptious style, including measurements, see my regular Minzah page, here. 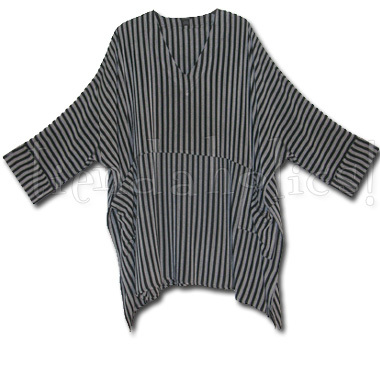 This GENEROUSLY SIZED tunic is IN STOCK NOW in gray/black stripes, usually a special order fabric!